There is nothing prettier right now than this cranberry goat cheese! I mean, guys. I made us a pink appetizer for Thanksgiving! And basically the rest of the holiday season. This is IT! No more searching for the snack you have to make for that party. 2018 is the year of the signature pink snack. I’m calling it right now. If something is pink, I will eat it. My festive recipe brain is working overtime because I want everything to look over-the-top holidayish. This is what kids have done to my brain. Fried it. And spread it with cranberry goat cheese. I’m no stranger to whipped goat cheese, even if I often prefer whipped feta instead. Both are so freaking good. But I should just say that I enjoy whipped cheese. That’s what it is. Whip all the cheese and I’ll eat it. This is the easiest (and prettiest?!) Thanksgiving appetizer. 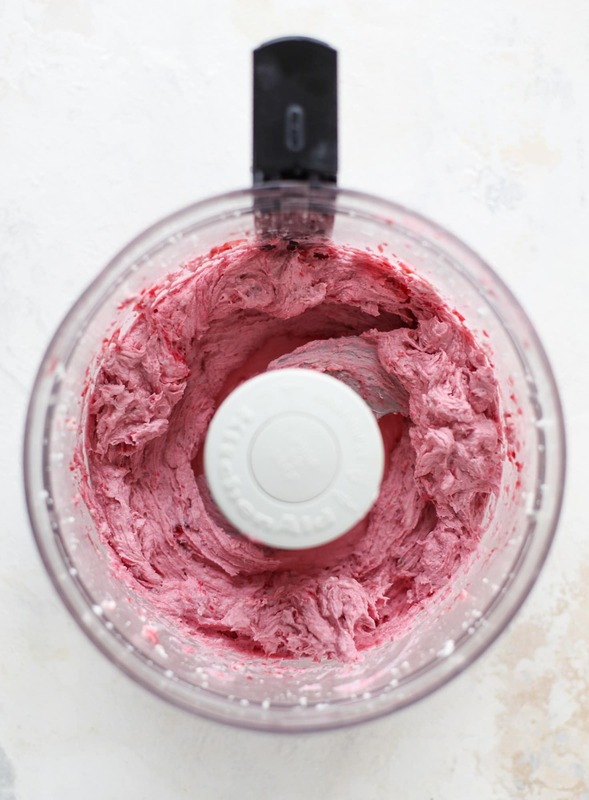 It’s such a gorgeous shade of pink and I’m obsessed because you can make it ahead of time, have it out as an appetizer or even use it as a spread for the dinner rolls on your holiday table. Amazing idea, right? The other great thing is that you can use a touch of cranberry sauce instead of the cranberry mixture below if you wish. I made some bursting cranberries with pomegranate juice and a touch of lemon. Whipped that all together with the goat cheese in the food processor to create my whipped goat cheese dream spread. It’s creamy, slightly sweet, tart and tangy all at the same time. When you spread it on a cracker (get the really seedy ones!) or baguette, it’s like a cloud of whipped cheese. Fluffy. Creamy. Delicious! You could make a small bruschetta or cracker board with this spread and have a separate bowl of pomegranate arils that can be sprinkled on the toasts. It’s such a festive snack. You just have to invite me. 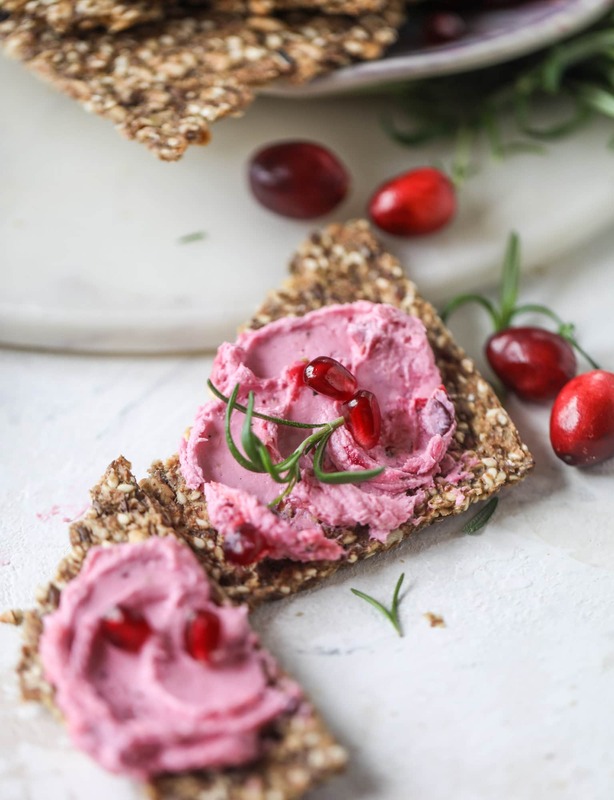 This whipped cranberry goat cheese spread is the perfect holiday appetizer! You can make it ahead of time and serve it with a cheese board or bread and crackers - before or during the meal! Plus it's super pretty too! Place the cranberries, pom juice, sugar and lemon zest in a saucepan and heat over medium heat. Cook until the cranberries are simmering and breaking down. You want them to be completely broken down and sort of thick and saucy, about 10 or so minutes. Transfer it to a bowl. Let the mixture cool completely. In the bowl of your food processor, pulse the goat cheese until it starts to come together. Turn the processor on and let it blend and whip the goat cheese until smooth. Add a pinch of salt and pepper and pulse. Scrape in about 1/4 cup of the cranberry sauce mixture to start and pulse a few more times so everything gets combined. You can blend it completely so it's smooth or you can leave it a little chunky. You can also add more cranberries if you want, but I like to serve it on the side separately too! Transfer the spread to a jar or bowl. At this point, you could cover/seal it and keep it in the fridge overnight before serving. Otherwise, serve it garnished with pomegranate arils, fresh rosemary and with crackers and bread for spreading. Delicious! This is basically like eating a food decoration because it’s SO PRETTY. 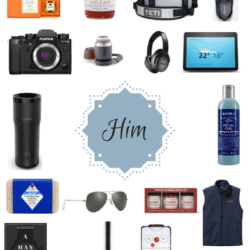 2018 Holiday Gift Guide: For Him. 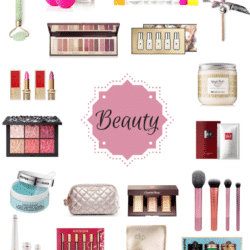 2018 Holiday Gift Guide: Beauty. Definitely the most gorgeous spread – so aesthetic. This is truly stunning. I love the idea of adding the cranberries. As always, you are such an inspiration. Cheers! This looks like the most fun thing to eat I’ve seen ever! I bought some canned whole cranberry sauce ( to make the cranberry bars out of your book 😊) so would that work instead of using the fresh cranberries? I can never seem to find fresh cranberries that look good! How much canned sauce would you recommend using? i definitely think you can!! i would start with maybe 1/4 cup and go from there? you can always add more! What crackers did you use? Those look so good. And this recipe looks delicious, can’t wait to try it. they are from trader joe’s!! called the crispbread! I would never have been able to come up with such a tasty dish of such simple ingredients! You are a culinary wizard! Hi Jessica – I will be making this for Thanksgiving, it looks wonderful! Would like to pin the recipe, but I don’t see a link here? Will you be adding one? Thank you! I made this tonight for tomorrow. I’ve made quite a few dips from this site and while this isn’t my absolute favorite it’s still really good. I added extra cranberries, juice and sugar. I would leave off the lemon zest next time as its tart enough as is. I bought some crackers that have seeds and cranberries and they really complimented the dip well. The crackers are just slightly sweet so pair well. I think the brand is Divas. everyone at my thanksgiving LOVED this. So pretty too. Can’t wait to make it again at Christmas! I made this, and we all loved it. I’m going to make it to take to a party next week, it looks so Christmasy. We liked it better a few days after I made it, seems like the flavors were enhanced. But either way, it was great. Thank you for this recipe.